- Elements Organizer splash screen freezes at launch. - Elements Organizer splash screen appears and then goes away. - Nothing happens on clicking 'Organizer' tab in welcome screen. - Organizer/Editor launches fine but hangs just after launch. Right click 'PhotoshopElementsOrganizer.exe' and select 'Run as Admin'. After this Windows UAC (User account control) prompt may appear, click on 'yes' button. By doing this hopefully Organizer will be able to start itself. Now by all means, you might be working on some other catalog (lets say it is 'BigCatalog' in my case). Also as Organizer wasn't launching previously it may also be possible that the catalog may be corrupt. 5. To re-use the catalog, Please perform 'Repair/Optimize' operations on your catalog. 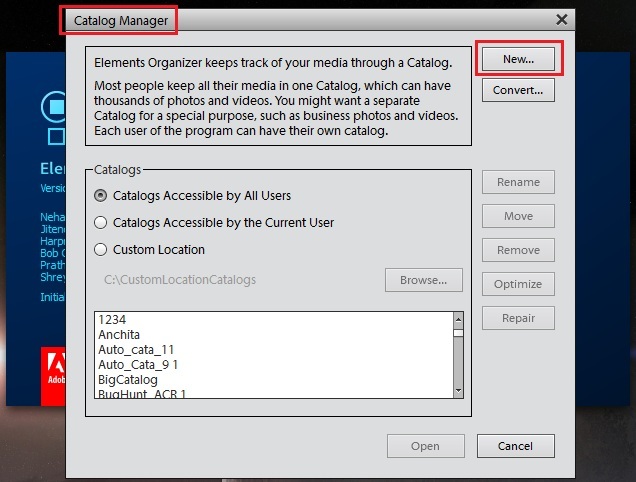 Detailed steps are present at here under 'Repair/Optimize your catalog' section <solution #2>. 6. Select 'BigCatalog' catalog and click on 'Open'. Now hopefully your catalog should work fine. 1. 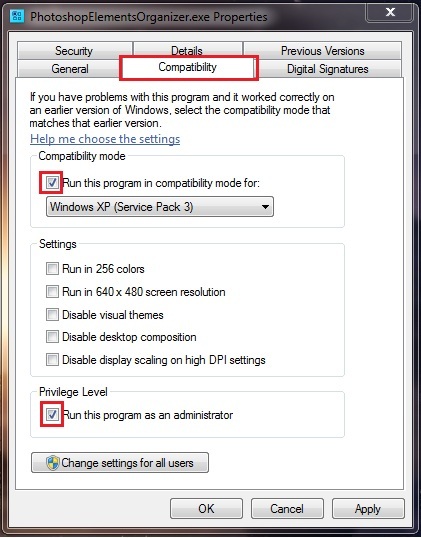 Right click 'PhotoshopElementsOrganizer.exe' (path mentioned in step #2 of Solution #1) and select 'Properties' and click on 'Compatibility' tab. Note: After doing this, if Windows UAC may be prompted (while launching Elements Organizer,) click on 'Yes' button. If the above mentioned steps doesn't resolve your issue then you need to do 'Clean uninstall followed by Installing PSE with Admin rights' <coming soon>.